I do not find any list of GNU/Linux distros that endorse certain computer vendors. So I write this compilation. You will see here KDE neon with KDE Slimbook laptop, Mint with MintBox mini PCs, Ubuntu MATE with Entroware PCs and laptops, and more on the main section; and with a lot of additional ones like Ubuntu Certified Computers and Respects Your Freedom (RYF) certified ones on other section. On the main section, I add as many reviews (articles or videos) as I can find for each model. I hope this list can give you rich information about relationships between distros and computer vendors so you can buy computers right from your own distro, so you as distro developer could consider to make engagement with certain vendor, and so you as a vendor could consider to make a great move into GNU/Linux. I wish you all the best. Enjoy! What I mean with the title is a list of GNU/Linux distros which have clear endorsement of one brand of computer. The clearest example is KDE neon and KDE Slimbook laptops, and this excludes Ubuntu and Dell XPS 13, and also excludes RYF laptops. Also, although I admire System76 laptops so much, I exclude them here. My idea is to promote distro-vendor engagement so everybody can buy GNU/Linux computers officially from their beloved distros, instead of having blind choices of Windows preinstalled computers without compatibility with GNU/Linux. And also with distro endorsement, users are safer from fraud, as I believe you don't want Litebook case to happen again. I hope I can list as much information as possible including the excluded ones (but in separate section below). Believe me, there are already so many GNU/Linux laptops you can buy from most popular GNU/Linux distros. This is my model for the rest of this article. KDE neon established endorsement cooperation with Slimbook vendor from Spain so they sell KDE Slimbook laptops. 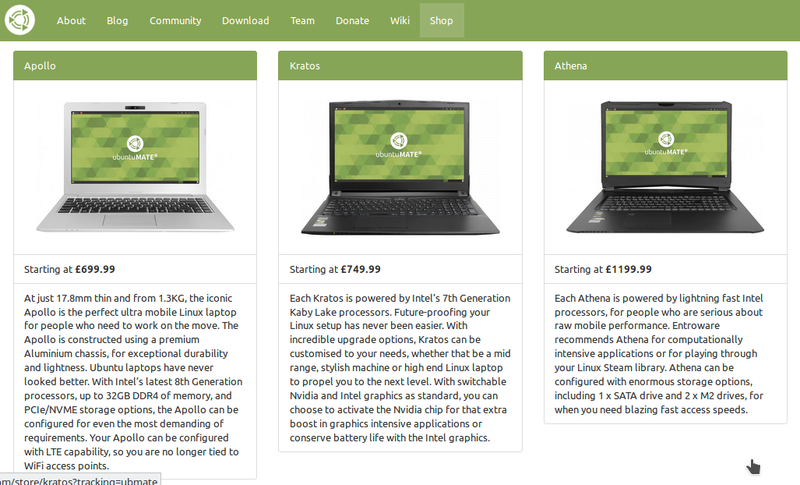 They show the laptop photo clearly in the website (even KDE.org webite shows it!). This is the cooperation I am looking for to present it to you. 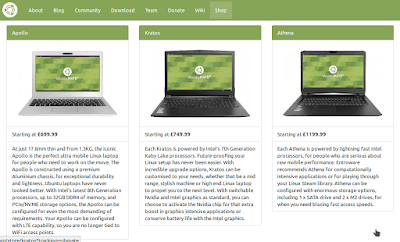 MintBox is another clear example like KDE Slimbook in this introduction. 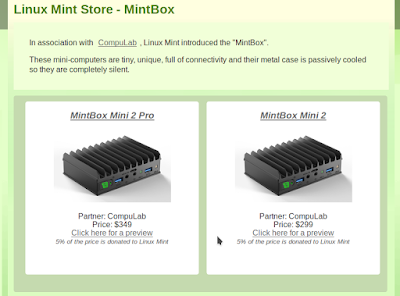 The website states very clearly it associates with CompuLab vendor to sell MintBox -- a small PC with Mint OS preloaded. It also puts the photos in a clear place on their official website. 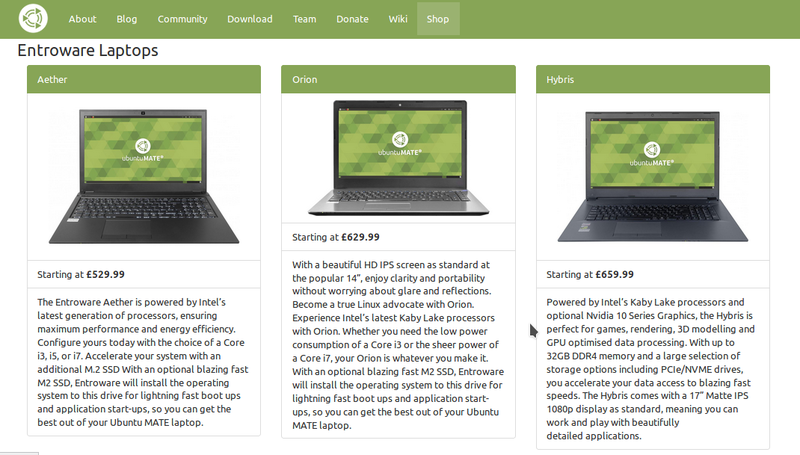 Ubuntu MATE is really another clear example. Even clearer, it endorses so many different models of laptops and also PCs from Entroware. All preloaded with Ubuntu MATE. 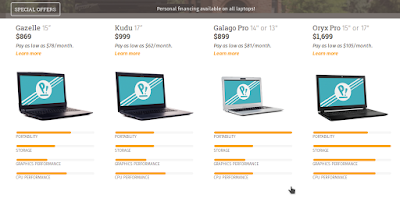 Manjaro is a very good example in cooperating with multiple computer vendors to sell multiple different laptops and PCs. 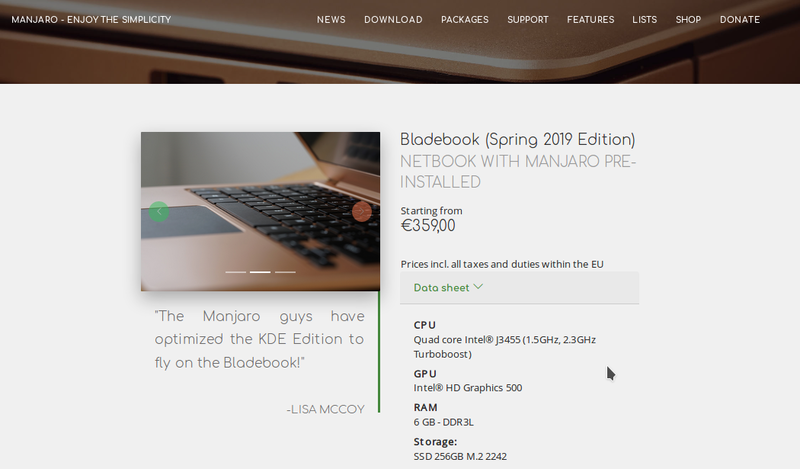 Manjaro now has Bladebook, Spitfire, and ManjaroBook, three distinct products. 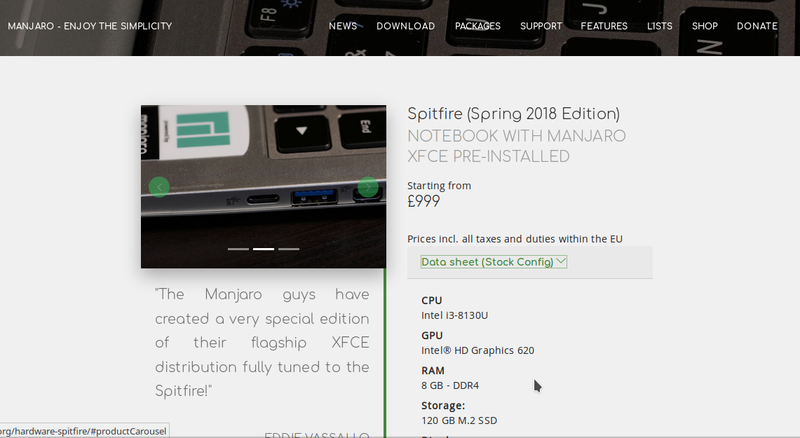 So it's different to KDE Slimbook (from 1 vendor), or Ubuntu MATE computers (from 1 vendor), Manjaro's are from 3 vendors. ManjaroBook is available in 10 different models in both mini PC and laptop forms. 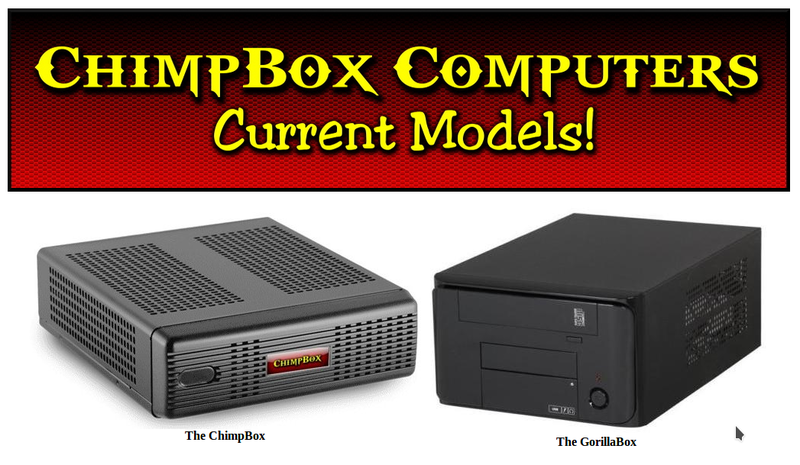 The oldest surviving Mandrake-based distro, PCLinuxOS, has a computer now called Chimpbox. It's similar to MintBox and Manjaro Mini PC above: small form PC without monitor nor external peripherals. 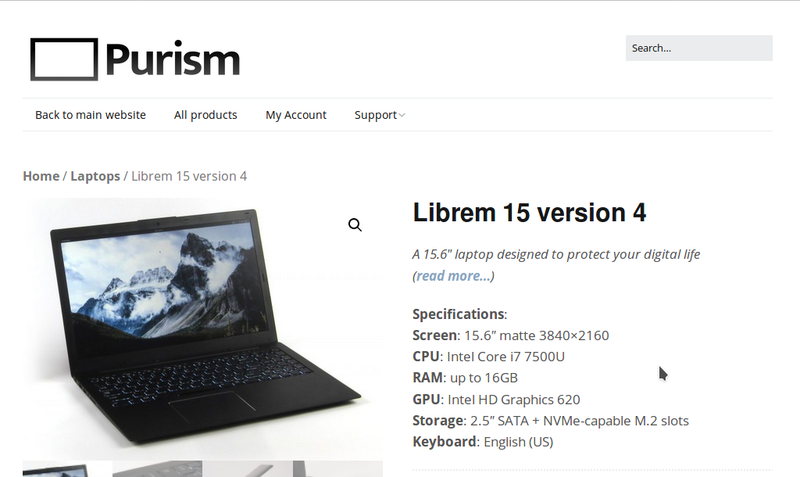 PureOS GNU/Linux and their high-end Librem laptops are under one vendor named Purism. 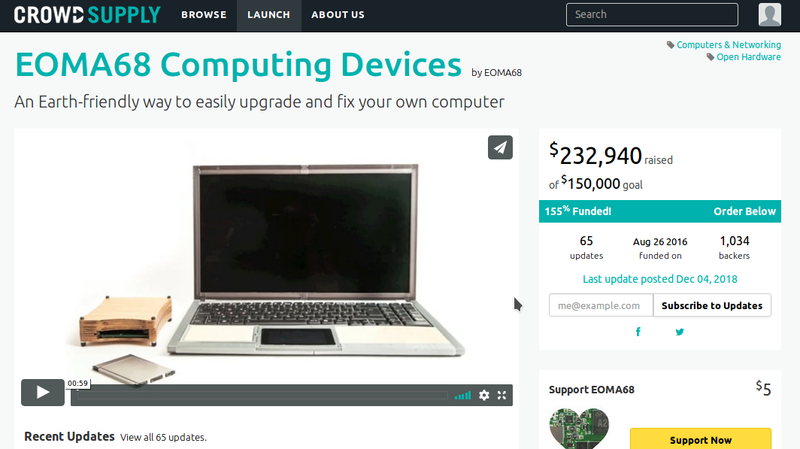 They got very popular after successfully held a crowdfunding in 2015 with total fund raised $1,050,000 for both laptops Librem 15 and 13. 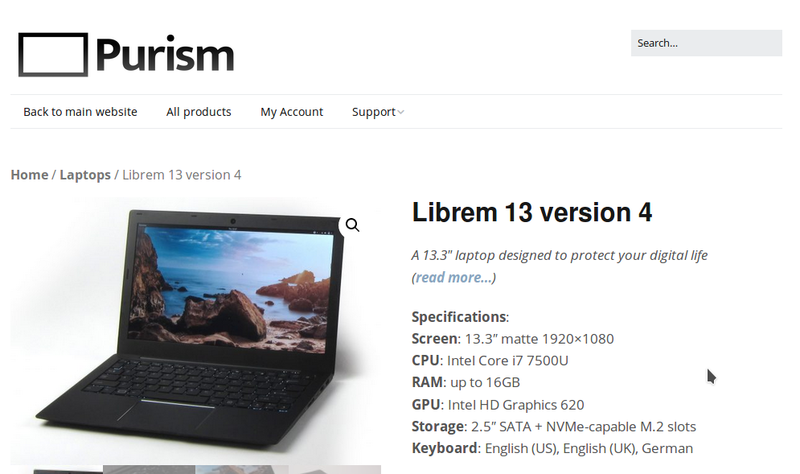 Librem laptop is the most reviewed publicly compared to any other one in this main section. 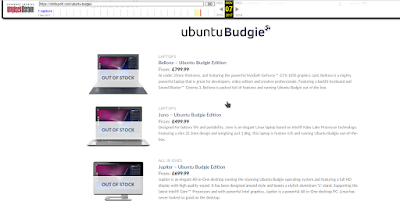 Please notice: Kubuntu and Ubuntu Budgie still have pages informing the computers but Nimbusoft website is inactive today ("Account suspended"). 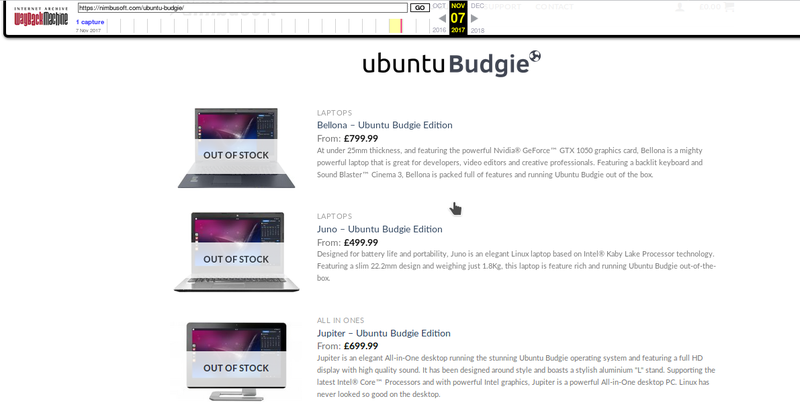 At 2017, Ubuntu Budgie team launched a cooperation with Nimbusoft, a vendor from United Kingdom, vendor to sell Ubuntu Budgie laptops. You can still see the announcement here and also OMG! Ubuntu review at the time here. It was a real thing. I don't know when Kubuntu started to engage same cooperation with same company, but in fact Kubuntu also endorsed Nimbusoft computers. 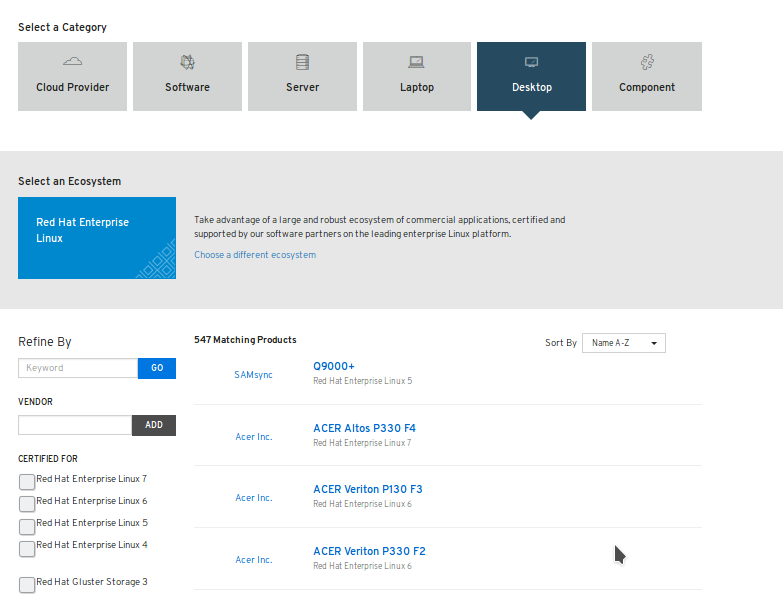 Unfortunately, Nimbusoft website is now inactive (although you can see past record from Internet Archive) and nobody can purchase any computer from it for now. Even the Twitter was stopped since 2017. The only information I have now is "Confirmation statement overdue" status of Nimbusoft company according to UK Government Companies House. Anyway, I still include them here as my appreciation to their efforts and I hope the company will be okay again soon. Others, but worthy to have a look at! Because the focus is the distro then I ruled out those that more focused to the computer. I ruled out RYF computers here, despite I loved them more, and also I ruled out Pinebook Laptop and Raspberry Pi. Even more, I ruled out Ubuntu-certified laptops although there are really a lot of them. But for the sake of giving you more information, alright, I mention some of them here with the links. Pinebook is a $100 cheap laptop with ARM processor. Being ARM means it resembles your smartphone: long duration of battery power and much more energy efficient. What made this special for me is the news from KDE that neon is already running on Pinebook laptop. Blue Systems company, Pine64, and KDE community are working together to support this new combination system. 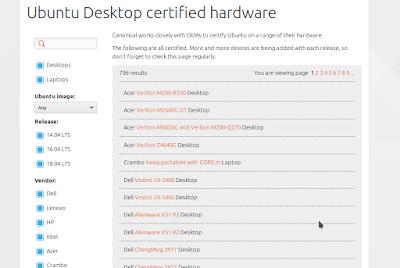 If you are looking for the laptop for Ubuntu, from laptop point of view, it's obvious that you can look at the extensive number of certified Ubuntu computers. 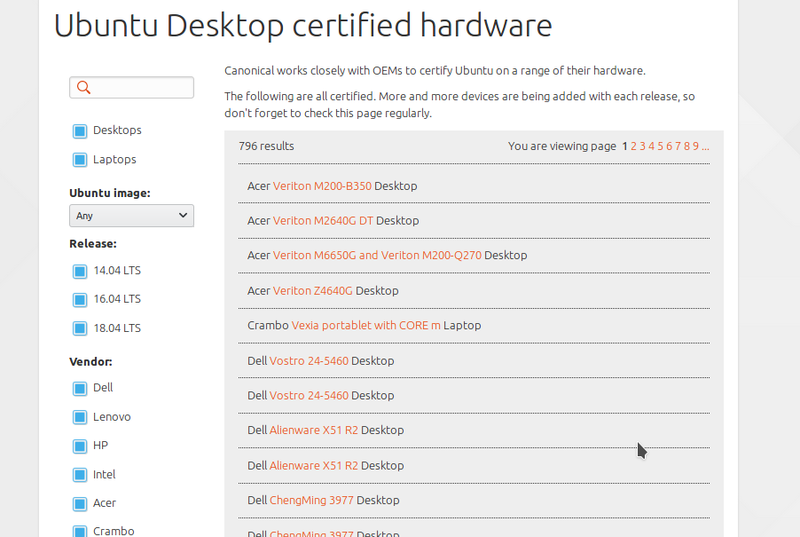 There are more than 700 PCs and laptops from various famous brands (Dell is the one pictured on Ubuntu main page) that are sold with Ubuntu preloaded and have certified by Canonical. 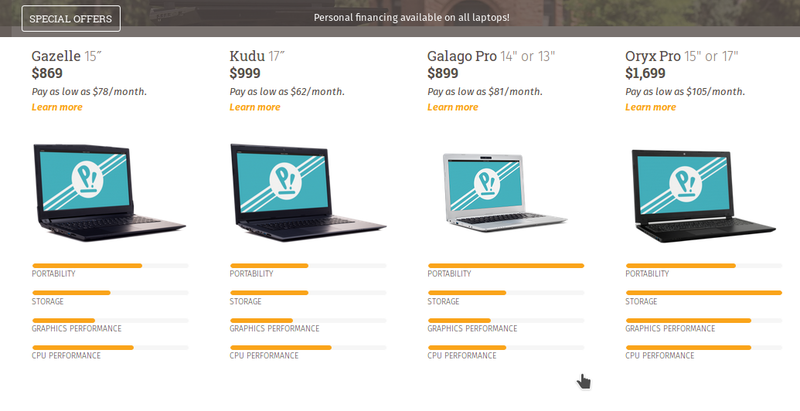 It's a good thing but it is not clearly endorsed and sold from the main page of Ubuntu (see example of KDE Slimbook) so I put it here. Of course Red Hat also has such thing like Red Hat Certified Hardware. If you need PC or laptop certified for running Red Hat OS (or Fedora or CentOS), then you can look at this list. There are more than 600 PCs and laptops from famous brands such as Acer certified to run Red Hat OS for desktop. Take example Acer Veriton P130 P3 which is certified with version 6.x and it testified by Acer's specification book saying the exact name of that Red Hat OS. 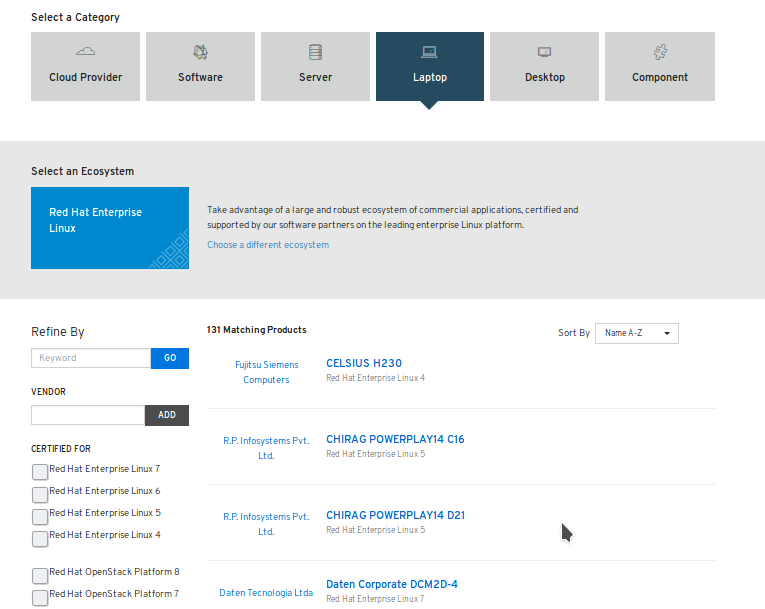 Through the YES Certification process, SUSE provides a huge list of compatible and tested computers working with SUSE Enterprise desktop operating system. RYF computers are direct opposite to my criteria above: they are computers which are sold with certain GNU/Linux distros. To see it closer, for example, Trisquel website does not endorse clearly a certain laptop product preinstalled with Trisquel (compare this to neon with KDE Slimbook). Anyway, RYF ones are the most libre-compatible hardware on the world today, starting from its libre bios (called "Libreboot"), libre operating system (100% libre distros), and all prebuilt hardware (VGA, WLAN) are compatible with libre software. That's RYF certification. If you have one, you are guaranteed to run all libre distros available today without driver/firmware compatibility issue at all. But again, because my tagline is the vice versa, I exclude them, and I mention them in this separate section instead. It is the special relationship I cannot include above. Yes, it is the vendor you and I all know, System76. It is a famous vendor which produces Ubuntu PCs and laptops. It's still offering computers with Ubuntu preloaded, despite now it developed it's own distro called Pop!_Os. I know the relationship between openSUSE and TUXEDO because I saw Richard Brown (openSUSE chairman) once promoted one TUXEDO Infinity laptop model in a video. I like the laptop. Although TUXEDO itself an openSUSE donator, openSUSE does not endorse their laptops like what KDE neon endorses KDE Slimbook. So I put Infinity Laptop here instead. 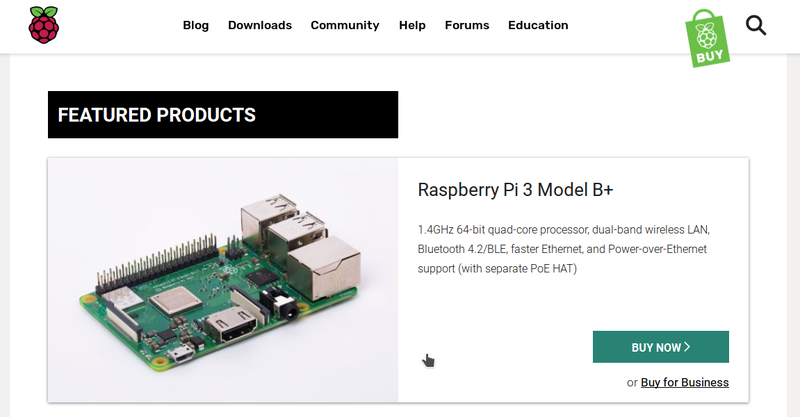 This one is no news for us: the really popular small ARM board computer running GNU/Linux. 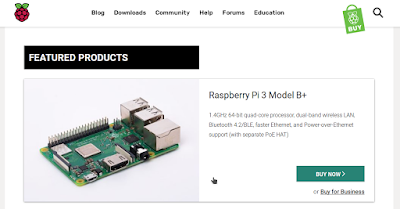 Raspberry Pi is very popular among hobbyists, teachers, and makers worldwide. 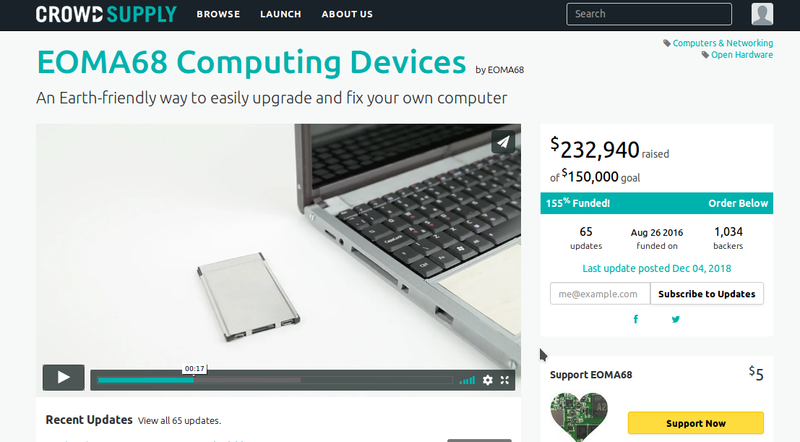 Same successful crowdfunding as Librem, but with slower progress, and up to today EOMA68 machine still has no official website except the crowdfunding profile. 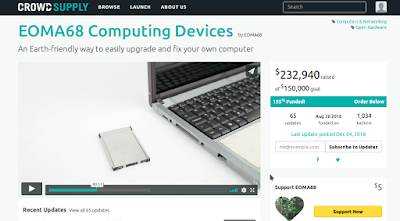 EOMA68, if successfully produced like Librem, can be a good 100% free software alternative to RYF laptops above.If you see the ideas and specs, you will see it's very very good, but unfortunately it's still not ready for public for now. GPD Pocket laptops are really small laptops with unique keyboard layout and touchscreen. It got very popular after its successful crowdfunding. 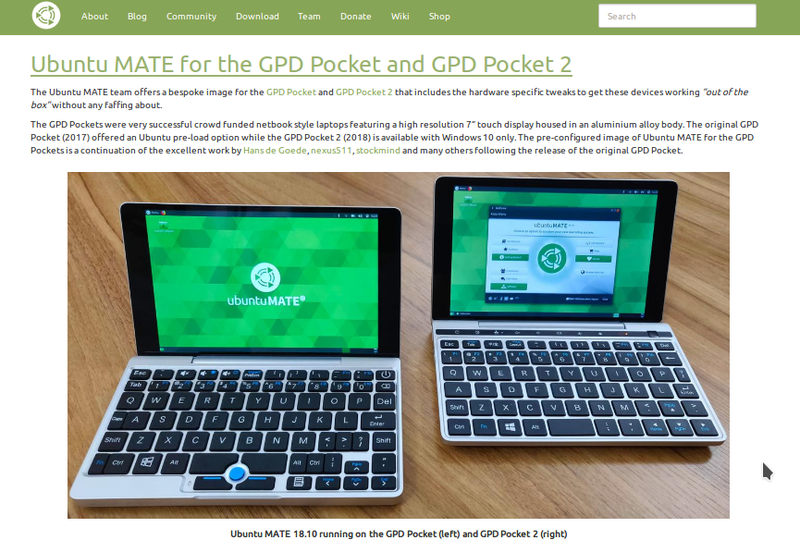 Ubuntu MATE has a special page about GPD. But unfortunately it is not an endorsement. 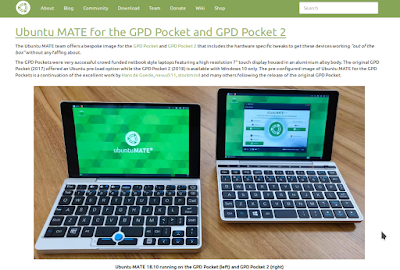 GPD vendor does not cooperate to sell GPD preloaded with Ubuntu MATE. That is why I exclude it from above and I can only put it here. That's all. Among all in the main list, the most popular one is PureOS-Librem seeing from the number of reviews. The distro with most number of computers is Manjaro-The Three, seeing from bunch of different models they offer. What want to say is, after writing all this stuff, I realized that reviews for GNU/Linux laptops today are very very limited. What you can see on the web mostly is only a "preview" not "review", not a thing written by touching and photographing the real machine. So I believe many people will have difficulty in finding ones they really want to buy. I hope this list informs you well about distros-vendors you may wish to buy the computers from. I wish you the best computer. One more thing, actually I wonder why Ubuntu MATE which is younger now has laptop cooperation with vendor while Xubuntu --despite being older-- does not have any. What I really say is official recommendation right from the distro (see KDE neon again). Same wonder goes for elementary OS, openSUSE, Mageia, Netrunner, even Trisquel itself. It benefits everybody, the fund may boost up the development and community benefits in the hardware recommendations (it saves time, effort, headache, and even money for the users). The nearest distro entitled to have endorsement is elementary OS in my opinion, as it's design-oriented (like macOS) and user-friendly (like Windows) and advertised everywhere (see Arstechnica, Wired, mac|life, Lifehacker, Forbes, The Register, CIO). It is interesting to see next time elementary OS to get such engagement with laptop vendors for both the community and the vendors. By the way, it's up to the developer teams and their respective communities to decide endorsement. Anyway, I wish you all luck in hardware endorsement. These ones are just my personal wishes. I wish the best for vendors, distros, and all GNU/Linux users. For the hardware vendors: I wish more vendors would consider RYF certification. I wish more vendors consider cooperation with distros like what Slimbook did with KDE or Entroware with Ubuntu MATE. For fellow GNU/Linux users: I wish you would get the best laptop right from your own distro right now.